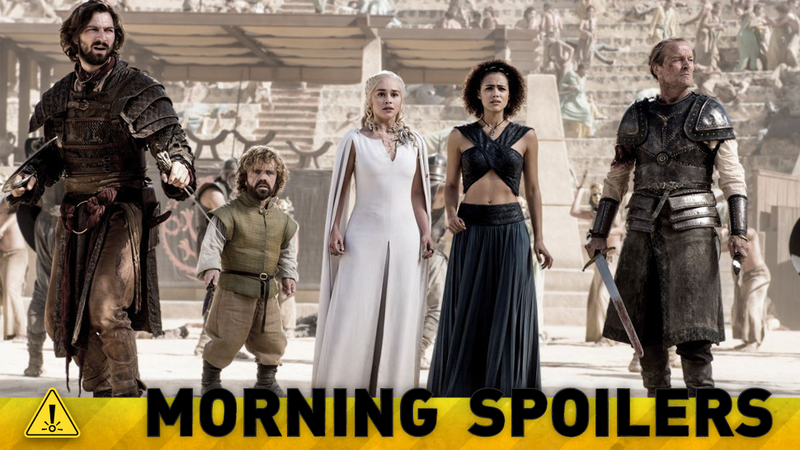 The Latest Game of Thrones Set Pictures Include A Hugely Revealing Costume Change! Ridley Scott says that Alien: Paradise Lost will have ties to Ellen Ripley. Chris Evans reveals what brings Captain America and Iron Man to blows in Civil War. Plus our first look at the last Resident Evil movie, new clips from Agents of SHIELD, and what’s ahead on The Walking Dead. Spoilers Now! In a way it is Prometheus 2. It’s exactly the same story. But it was always in the works to be called that [Alien: Paradise Lost]. Is Prometheus actually taking us off course from where I’m going, which is actually backing into the first Alien... I’ve even got connections with Ripley [in this], but I’m not telling you what. Yeah, I mean you look at him and you realise he’s not a good guy! He’s got an English accent so he can’t be good. Yeah, it’s fun to do different things. I hadn’t played anybody like that before. Star Wars is amazing, J.J. Abrams is amazing, but the thing to do was play something different. That’s what got me really excited. I’m very frustrated by that. Out of the need to be secret, we’re not actually able to get everything we need to do our jobs as well as we could, and as someone who has been doing it for 35 years, I find it very frustrating. What I can say about the new movie is that if you were a fan of the original three, you’re going to absolutely love this one to bits. You can expect a smorgasbord of people you love. But Cap has his reasons, he certainly has his reasons, and he is a good man and his moral compass is probably the cleanest, this is a tough thing. This is what made it so interesting while we were filming, and it’s hopefully what will make the movie great is nobody’s right, nobody’s wrong. There’s no clear bad guy here. We both have a point of view, which is akin to most disagreements in life and politics. I think Star Trek has prided themselves as being quite classic when it comes to villains, like ‘he’s a guy who wants to end the world,’ there’s no doubt about that. But in this version of the film, there’s a slightly different twist to that. It’s quite an interesting journey, which I think is groundbreaking for the franchise. But, it still keeps with the ‘classic bad guy is a classic bad guy’ tone. Milla Jovovich has posted a new picture from the set of herself and Ali Larter (returning as Resident Evil video game character Claire Redfield). Here’s a new TV spot for the latest Bond film. Although this is most definitely not the first time we’ve heard about Snow’s return, it’s our first hard evidence of him on set. But the real news is the fact that Jon is no longer wandering around in his all-black furs of the Night’s Watch, but instead is wearing what is very clearly the House Stark leather armor seen throughout the show’s earlier seasons. The character is talking to two undisclosed characters, but Watchers on the Wall speculates that they could be Jorah and Daario, on the hunt for Daenerys, as Lubany’s character mentions that the master of one of these undisclosed characters has Dragons. The show has cast yet another Batman villain: this time Looking’s Raul Castillo as the hitman Eduardo Flamingo. According to Variety the character will appear in the second season’s ninth episode, and Flamingo, “Armed with a spiked chain and an appetite for flesh, this rock-a-billy assassin will prove to be one of Detective Jim Gordon’s trickiest foes”. Liv (Rose McIver) and Detective Babineax (Malcolm Goodwin) investigate the murder of a hard-partying frat boy whose death shocks everyone. After consuming his brains, Liv attends a fraternity party in an attempt to search for clues, but ends up ruling the beer pong table instead. Still desperate to find the cure, Ravi (Rahul Kohli) takes matters into his own hands and brings Major (Robert Buckley) along for the ride. Meanwhile, Blaine (David Anders) meets with Angus (guest star Robert Knepper), a mysterious person from his past. INTRODUCING JAY GARRICK - Jay Garrick (guest star Teddy Sears), a mysterious man fromEarth-2, appears at S.T.A.R. Labs with a dire warning about an evil speedster named Zoom, who is set on destroying The Flash. Barry (Grant Gustin) and the team must decide if they can trust this stranger even as they face yet another powerful meta-human. Meanwhile, Joe (Jesse L. Martin) must deal with a determined officer named Patty Spivot (guest star Shantal VanSanten) who wants to join his meta-human task force. ONE STEP AHEAD – When an impulsive decision by Damon (Ian Somerhalder) threatens to unravel a carefully negotiated deal between Stefan (Paul Wesley) and Lily (guest star Annie Wersching), he has no choice but to make amends with his mother before things spiral further out of control. However, Lily remains one step ahead and carries out a harsh plan that hits Damon where it hurts most. Elsewhere, after returning to Whitmore Collage, Alaric (Matt Davis) turns to Bonnie (Kat Graham) for help with a mysterious and potentially dangerous artifact he has obtained, while Matt (Zach Roerig) is forced into making a risky life or death decision. Meanwhile, Caroline (Candice King), who finds herself a pawn in Lily and the heretics’ plan for retribution, uncovers a shocking detail about Stefan’s past. She’s much more space bound. The ties to Earth are being cut. Me and Steven have been discussing for a while how to do it, and when to do it… and just tell a really good story. And I was really flexible about how to do that and when to do that, and… it’s really, really cool. Finally, the cast and crew look ahead to the sixth season in a new behind-the-scenes featurette.